Dentist Discusses the Top 5 Reasons To Get Regular Dental Care! 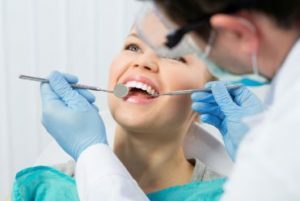 People have a lot of reasons for skipping regular dental visits such as time, money and dental phobia, but what if you found out that it can actually lead to more pain in the long run – not to mention more time and money spent in the dental chair? In truth, the more consistent you are with your checkups, the less major dental work you’ll need down the road. Keep reading for the 5 best reasons to schedule routine care with a dentist – you’ll be on your way to preventing problems (rather than treating them) and maintaining a healthy smile for life! At every checkup, both the dentist and hygienist perform an oral cancer screening. They visually examine your soft tissues such as your throat, tongue, cheeks and lips, looking for any suspicious lumps, bumps or lesions. As with all cancers, early detection is key. Many people assume that they would feel a cavity right away, but in many cases, cavities don’t cause pain until they’ve gotten larger. At that point, they require more extensive treatment to fix. However, a dentist uses diagnostic tool such as annual bitewing X-rays to detect small cavities that they can’t see with their eyes alone. That way, a cavity can be treated with a relatively simple, inexpensive filling instead of a dental crown, root canal, or both. Gum disease is the #1 cause of tooth loss. It’s also a “silent disease” (similar to diabetes), so you wouldn’t necessarily feel it until it’s advanced. At that point, the gums and underlying bone that support the teeth have been damaged or lost, which can ultimately cause the teeth to become loose and fall out. The good news is that good oral hygiene and regular checkups can help prevent gum disease. It can also be well managed with gum therapy, although treatment is more effective in the early stages. Consistent brushing and flossing is crucial for keeping your teeth and gums clean and healthy. But even with good oral hygiene habits, you still can’t remove hard, cement-like tartar deposits or reach every area under the gumline. Getting a professional cleaning is the only way to thoroughly remove plaque, bacteria and tartar from the areas where it can cause the most harm (gum disease and cavities). In addition, regular cleanings prevent bad breath and help your teeth look their best! When it comes to caring for your teeth, prevention is the name of the game. If you have untreated problems such as cavities or gum disease, either you can decide when to get treatment – or your teeth can decide for you. It’s much easier to schedule preventive care or dental work on your own time rather than risk a dental emergency on vacation, in the middle of the night, or during a busy work day! Dr. Jayme Martinez is a family dentist who encourages everyone to get routine care for their teeth and gums. He wants to help his patients prevent problems, rather than treat them, and knows that regular checkups are the best way to do that. If you’d like to schedule a checkup or have any other questions, he can be reached via his website or at (214) 303-9969. Comments Off on Dentist Discusses the Top 5 Reasons To Get Regular Dental Care!